Changes in how search engines look at websites is a regular occurrence. As noted more and more they look to authority sites, the way they treat content and so on has meant that we have now incorporated a blog in our website. Like some of my other clients, who have separate blogs to their company website, I used the blogs to build backlinks to their website. While this strategy is still relevant today, what we tend to go after now is to build authority sites. After all “content is king.” So, websites with more content, and not just any content, but relevant original material, will be favored by the likes of Google. After all that’s what search engines thrive on—going over content to index these. It’s their reason d’être, the reason they exist. Let’s look at one of a client who uses a blog on the company website: Aztex Equipment. Going through the site, one notes there is a lot of emphasis on safety and maintenance. So what, you might say. 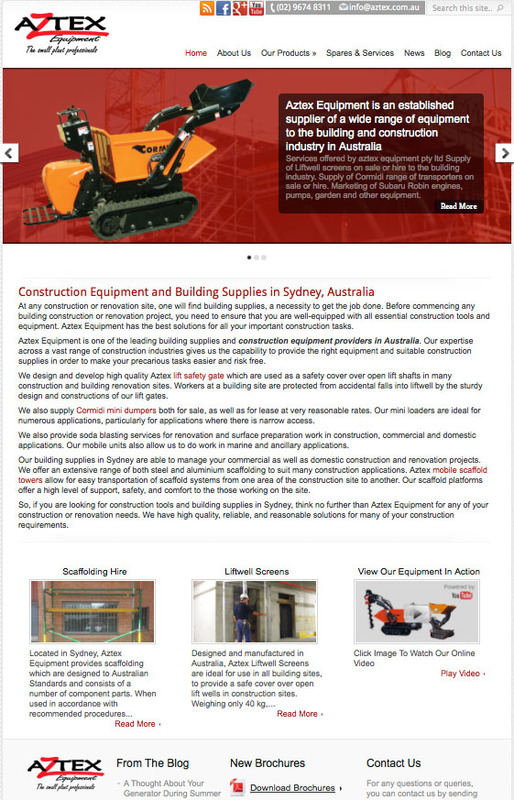 Aztex Equipment incorporates a blog as part of its website, helping build up relevant content. Well, now hold on. People who buy equipment from a supplier want to know about how to use the equipment safely, how to keep the equipment in tip-top shape and keep this going for a long time. So, they browse the site, do search and find an item on maintenance or safety which is interesting and what happens next. The viewer may bookmark the page, get the URL and send a link to a friend who has a similar use for the article or is looking for something like what’s contained in the article and so on. The article may be quoted in a forum or sent to users’ site and so it goes. Each time the client adds a post, we notify search engines. This is something that they still like and look forward to. Compare this to uploading more pages to a normal website (as opposed to a blog), and the search engines don’t bother. With more posts, search engines re-index the pages and this, in the end, helps improve search engine rankings. While I may be trivializing some things noted here, it’s worth noting that the point is to put up posts. We do other things for the client and that is not covered by the scope of this post. Suffice it to say, more content, especially in a blog format, is a great tool. It not only helps you with the likes of Google, its a great resource for your viewers and customers.